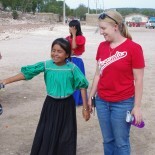 We had a good trip up to the Huichol village this last Friday. For those of you who are praying about the new mayor who is to be elected there, keep praying! There was no news as of Friday about the date of election or who is expected to win. The last time they elected a mayor, 3 years ago the person selected by the people was quickly ousted for a person from the political party that was in power in the next bigger town. So, that was disappointing for us, and for the people in the village. Hopefully this time the person the people select to represent them will be able to have that position of authority. And of course we are praying for someone who is favorable to our visits as well. Since the last election the Christians in the village are more organized and much stronger in their faith. Many more have taken steps in their faith such as baptism. It’s cool to see how much has progressed in 3 years. This village is being changed by people who have hearts for Jesus! They are “getting it!”. Some unique corn we had on our way back from the village. We often give people rides from the village to other cities on our way back to Zacatecas. The person who rode with us brought corn for the road trip, and as is customary, shared with everyone in the car. 5 years ago when we had been on the field less than 6 months we visited a baptist missionary in a city called Tepic who has worked with the Huichol for over 20 years. She told us that things really started to pick up ministry wise when they had a few leaders among the Huichol who “got it”. What does that mean? People who get it are people who are leaving behind the old customs, sacrifices, beliefs in the gods of their ancestors and are understanding that Jesus says he is the only way. They are people who are passionate about leading others to Christ and helping them grow in the faith. I think we have several people in the village now falling into that “getting it” category. And at least half of these people wouldn’t have been in that category 3 years ago I would say. Our co-missionary Sheri is leading a class for them women who already believe in Christ and want to learn more. Anabel is finally breaking in some teeth I believe. She’s been fussy, pray for her little mouth. I’ve tried putting the teething things, or a wet wash cloth in the refrigerator. She puts the cold item in her mouth and then looks at me like I’m a crazy person for thinking she would enjoy that. Haha, sooooo onto the next method of helping her with the nuisance. This entry was posted on November 13, 2018 by anaprice.